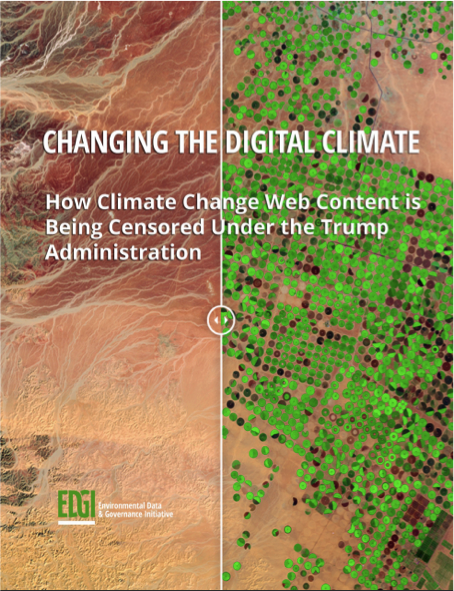 In November 2016, the U.S. elected a new president who had sworn to roll back important environmental protections, dismantle the EPA, and who had once called climate change a “hoax.” In the context of warming global temperatures, rising tides, and oil pipeline battles, a dozen colleagues at universities and nonprofits across the country got together online, and decided to do something. 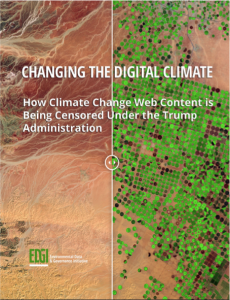 We were concerned about the continued existence of federal environmental agencies—particularly in their abilities to protect the most vulnerable among us—as well as the preservation and accessibility of important environmental and climate data. More broadly, we were concerned with the collective investment in public research and agencies. From our initial email we grew into the Environmental Data & Governance Initiative (pronounced “edgy”), today a North American-wide network that includes 175 members from more than 30 different academic institutions, 10 nonprofits, and caring and committed volunteers who come from a broad spectrum of work and life backgrounds. Our work has included crowd-sourced archiving federal environmental datasets, monitoring and reporting on changes to federal environmental agency websites, and interviewing employees at EPA and OSHA. Major news outlets have reported on us, from the Washington Post to CNN to the New York Times, and we have contributed to and helped shape an ongoing, national discussion on the value of federal environmental protections, and the need for accessible and accountable data infrastructures and publicly-engaged forms of data stewardship. 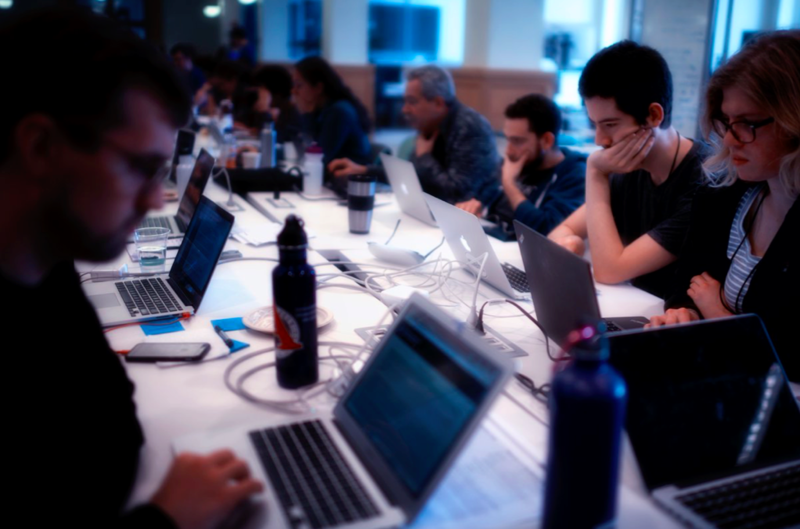 DataRescue event in San Francisco in February 2017. Photo by Jamie Lyons. So much of what we have been able to accomplish over the past two years is enabled by the Internet Archive, and in particular the Wayback Machine. 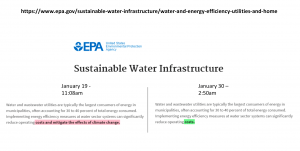 For example, our first event in December 2016 sought to archive EPA websites, prior to Trump’s inauguration, by nominating key pages and datasets for inclusion in the Wayback Machine. This project grew over the subsequent 5 months, as over 49 DataRescue events were held across the country, and over 63,000 web pages from environmental agencies like EPA, NOAA, NASA, and OSHA were nominated to the archive. The DataRescue project ended in June 2017, but not before raising important questions about the politics of data accessibility and stewardship. Through DataRescue we began partnering with the Internet Archive, which has become essential in another EDGI project: tracking ongoing changes at federal agency websites. Initially using a fee-based software program, Versionista, to crawl government web pages (currently crawling 42,000 URLs), we have been able to locate and report on the removal or alteration of web content on climate, non-renewable energy sources, and important environmental treaties. This kind of work increasingly relies on the Wayback Machine, and our reports systematically include references and screenshots from it. In our commitment to building participatory and responsive civic technologies and data infrastructure (partly inspired by the Internet Archive), we also developed our own web monitoring software, called Scanner, that is free and open-source, and which we plan to turn into a public platform. We are partnering with the Internet Archive to develop its functionality. 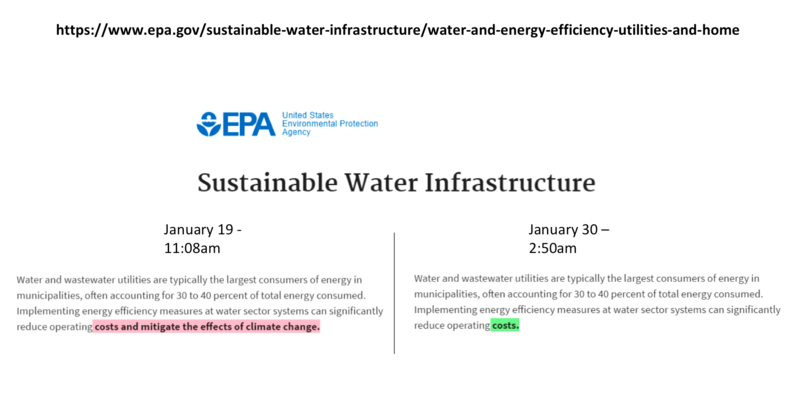 Example of screenshot comparisons (using Versionista) on the EPA website, where references to “climate change” have been deleted. Let us end with a few words about why this work, and our partnership with the Internet Archive, is so important. Our current federal records laws are outdated—they do not require online publication or webpage preservation, even as online research and access today is the norm (and the expectation). Many of us who work with vulnerable communities on environmental justice issues have seen how access to online state environmental data is essential for social groups seeking to learn about and document environmental harms in their community. Data access is a justice issue. Beyond mere access, we need creative, participatory, community-based, transparent, accountable, and justice-oriented data infrastructures, and new communities of data practice and care. We need these not only to enable government and industry accountability, but to help usher in a better, more just world. The Internet Archive’s commitment to participatory archiving, archiving vulnerable content, and free access, has both inspired and enabled EDGI’s work, and we are glad to partner with the Internet Archive to continue building this important data ecology and community of practice. University of California, Santa Cruz. She is one of the founding members of EDGI. Do you know if one can find EPA vs. American land owners, through this cite ?